Econocorp provides simple, compact, and affordable packing systems for the food industry. 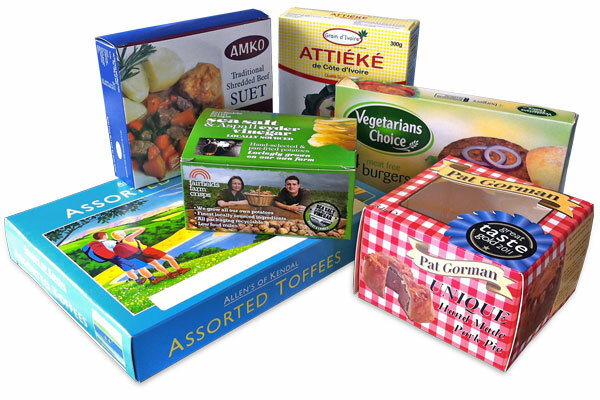 Packing everything from small snack foods to big bottles of cooking oil, Econocorp has the capability to meet all your packaging needs. Check out the videos below for different applications of machinery within the food industry. Please note that machines offerings are not limited to ones shown on this page. The Econocorp Twinseal carton gluing machine offers vendors in the food industry an economical, simple and compact machine that makes low to moderate volume packing in cartons a reality. This system can package bowls of applesauce, candy bars, and many more. The Econocorp E2000 automatically erects cartons out of a magazine, then either loaded manually by an operator or the option to be fully automatic, and finally glue sealed. This system can package packets of sugar, bags of chips, candy bars, and many more. The Econocorp spartan automatically erects cartons out of a magazine, then either loaded manually by an operator or the option to be fully automatic, and finally glue sealed. At about twice the footprint of the E2000, the Spartan offers twice the throughput. This system can package cream cheese bars, pretzels, frozen pizzas, and many more. The Econocorp Pegasus automatically erects cartons out of a magazine, then either loaded manually by an operator or the option to be fully automatic and finally glue sealed. In this case after the boxes exit the Pegasus they are brought over on a conveyor belt to an Econocaser where the boxes are stacked and packaged into a shipping box to be distributed. The Pegasus is the fastest in the Econocorp product line offering speeds of up to 120 cartons per minute. This system can package boxes of cereal, frozen premade dinners, and many more. The Econocorp Trayformer takes a flat blank and erects the flat blank into a tray. The tray is then discharged onto a belt conveyor to be manually loaded by an operator. This system can erect trays to be packaged with frozen fruits and vegetables, snack bars, and many more.